Dry Flush | The Waterless Toilet » Dry-Flush LLC Refill Pack. Two packages grouped for a lower shipping rate. Dry-Flush LLC Refill Pack. Two packages grouped for a lower shipping rate. (2) Packages of refills grouped together for a lower shipping cost. Each package includes 3 refill cartridges, disposal bags, twist ties, rubber bands, and instructions. Approximately 17 flushes per refill. 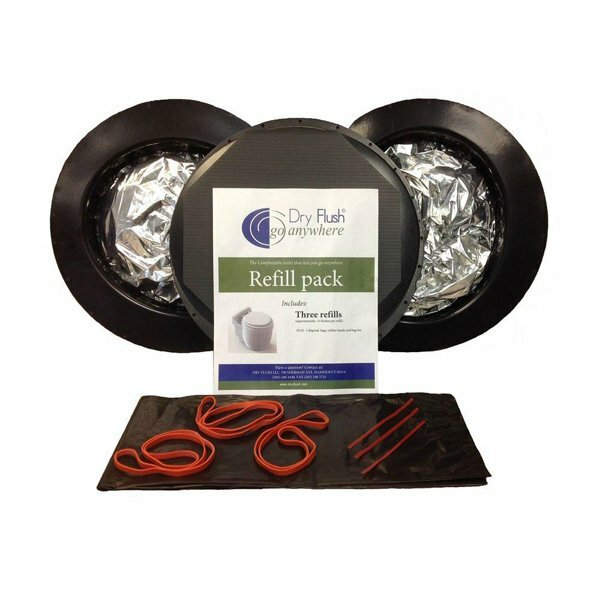 Dry-Flush LLC Refill Pack. Four packages grouped for a lower shipping rate. Dry-Flush LLC Refill Pack. Five packages grouped for a lower shipping rate.